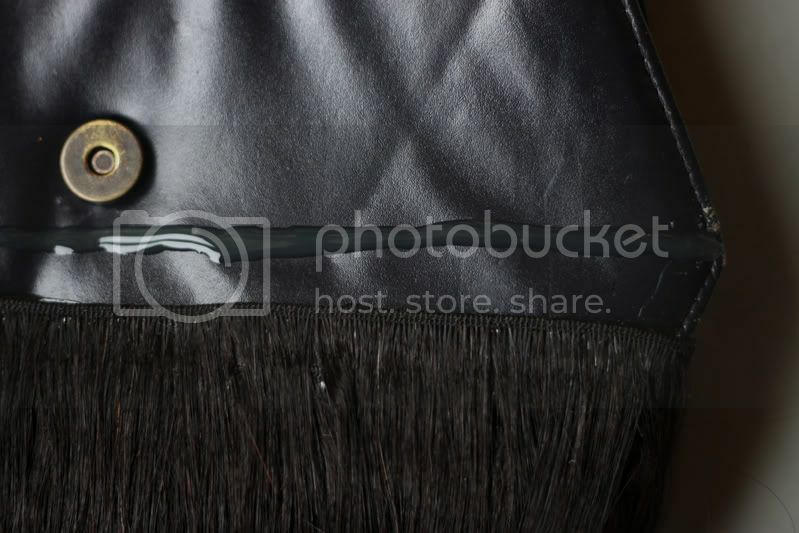 Hair on leather, goat hair purses and jackets that have blown my mind plus my obsession with hair resulted in this project. I created a new hairy friend, the perfect piece to give any outfit an odd touch. It could come right out of Morticia Adam’s wardrobe. *Optional, I also added a golden chain to the strap. I felt all that hair needed some hardware to not look too much like a wig on a strap. What you are going to do is glue on ‘rows’ of hair on your purse starting at the bottom. Depending on how large your purse is and how much hair you have to cover it with decide on how much space you are going to leave in between each row. I left about 2 cm between each. 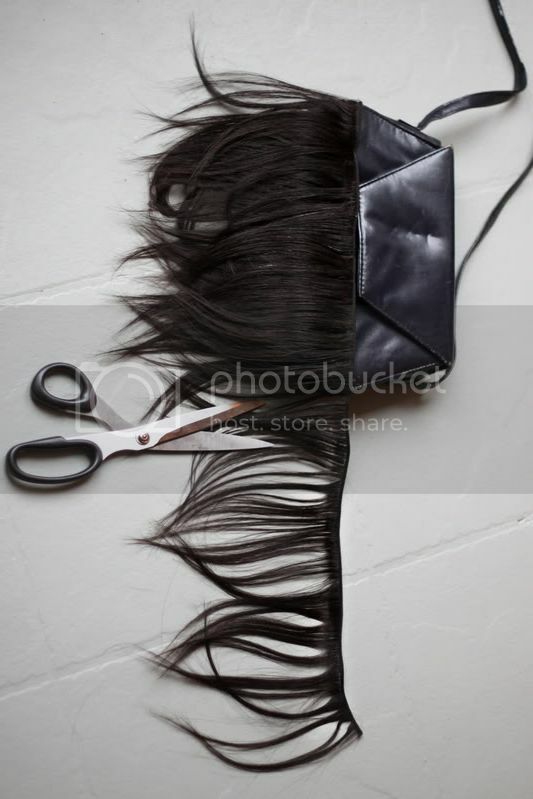 Measure how long your next row is going to be, cut the hair to the right size and glue it on your purse. You’re going to be left with some short left over pieces of hair. Use those for the lower rows, or the rows on the back of the purse. 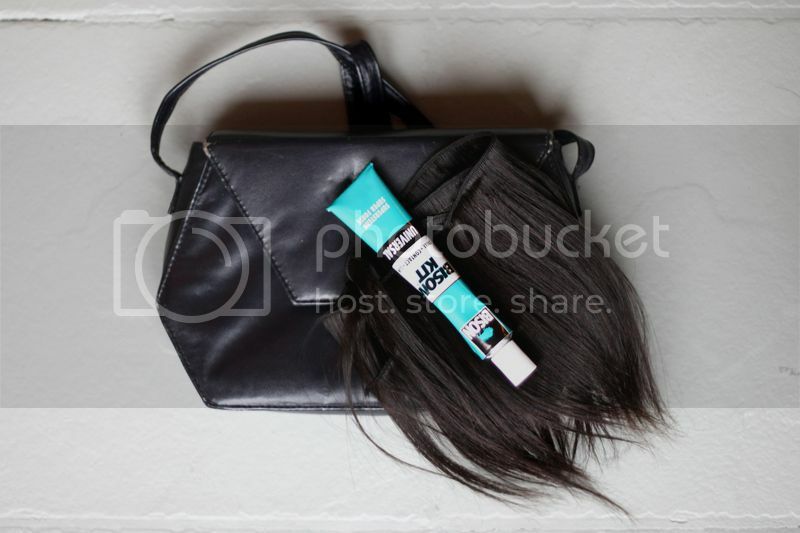 Be sure to save some entire strands for the top of the purse, because those are going to be visible. Go on gluing the rows upwards until you reach the top. Then glue the last two in the same direction at the back and make the hair go over the top. (see image that the hair looks like it’s flipped from that back to the front) You can even style it into shape with a straightening iron. Heel creatief, maar ik vind het wel een beetje te freaky voor mij haha. Maar je DIY zijn echt geweldig! Oh, this reminds me of that guy on Project Runway who made his entire collection consist of human hair! I think it's really wicked, and really creative of you with this DIY. Looks great! great idea doll... looks awesome! That's a great idea, the bag looks great! it IS odd, but cool DIY!!! GENIAAL!! Vind hem echt prachtig. Bekijk ook even mijn nieuwe tas, ze hebben wel overeenkomsten vind ik! Vreemd, but I like it! this is amazing! definitely looks like it could have came out of the addams family wardrobe... but i love it even more for that. well done on adding the strap, i do think it's necessary! once again, zooo creatief! ziet er echt goed gelukt uit joh! ik had vroeger ook van die hairy tassen, maar niet van die lange menselijke haren haha. geeft idd een 'odd' sfeertje maar heel tof! Once again, this is amazing. I can't believe how well you transformed that bag. Gewoonweg geniaal haha, het is dat ik zelf niet echt iets met "haar" heb maar het ziet er super uit! I am so jealous. Now make the hair shoe (Nicholas Kirkwood). Super joh! Ofja, het past niet echt bij mij maar je bent zo creatief en stijlvol! En je tattoo vind ik ook echt super!! hahaha this is so rad! And you did it again, Fantastic! Perfection! I'm loving this so much!!!! Amazing photos & bag !!!!!! WAUW! Ik beland net op je blog en jouw blog beschrijft de stijl waar ik van houd! Je DIY zijn helemaal geweldig en ik heb daarom een klein artikeltje over je gemaakt! Ik volg je nu ook! Kom je trouwens uit Arnhem? -you are welcome to take a look at my blog. ur amazing at diy! absolutely amazing! Geweldig idee. Wel een beetje morbide maar geweldig haha. Je nieuwe tat is geniaal. Hoe kwam je er bij? Wauw, ik moet het je nageven; het ziet er geweldig uit! ik vind het echt geweldig! this is SUCH an incredible post. i love the purse and i am definitely making my own. Geweldig weer ! Wat ben jij toch super crea he ! i loe this idea to make a hairy purse. where the model wear hairy outfit. i love the concept but i think that's to much if i turn it in my daily outfit. 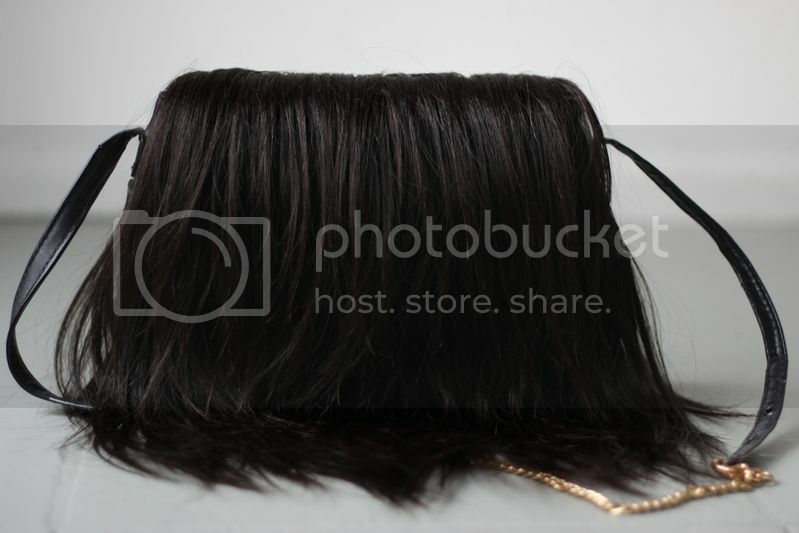 But with this hairy bag, that's totally the best solution to take this hairy concept on my everyday style. AAAh, this is just an amazing blog! I didn't noticed you before! Love this DIY - the finished bag looks amazing! my gosh i love this so much! shall definitely be having a go at it myself! Awesome DIY. This bag is killer! love it, love it !!! Ik had al gereageerd, maar wilde je nog even laten weten dat ik je doorgelinkt heb én heb getagged, haha! love this DIY! You never fail to dissapoint when it comes to creative new DIYs, you rock! clever!! not sure that i want a purse with hair though, but you totally rock it! I don't know how I feel about it. It's sort of creepy. But I love that you did it! this is so freaking awesome! just found your blog..looked through the whole thing...LOVE! following. Your DIY's are always fantastic, I think I'm trying this one when I end my exams, the result is excellent! wow you're very creative! great DIY, I especially like how you added the gold strap. amazing! you are so creative! If you made a heap of these, I'd buy one from you. wow. that’s nice! n it doesn’t look that creepy on the photos.. hahhaa.. great blog. following! @ Click here to help! This is insane, what a fabulous post! I love how the bag turned out, it looks amazing! WAUW ik vind het echt geniaal! Serieus, supertof, en zeker niet freaky! Love this bag and your whole blog in general! gosh this is amazing! very creative. Completely brilliant. I definitely want to try this! freakish but i love it! you did a reat job. May have to nab this idea sometime in the near future! Heee, ik zoek al heel erg lang zo'n soort tasje! I actually did this with a twist I'll post pics soon. All I used a was old leather cylinder bag a h&m chain and a belt from I was 4 oh and a good old pack of weave lol came out great! what??? this is amazing. so creative !